PLEASE SEND A PHYSICAL MASTER AND ARTWORK TO PO BOX ADDRESS AS PER WEBSITE www.testa-rossa.com PLEASE DOWNLOAD A CUSTOMER ORDER FORM FROM WEBSITE FILL IN AND SEND WITH MASTER. ALTERNATIVELY SEND A COVERING LETTER WITH ALL ORDER SPECS, DELIVERY, EMAIL AND TELEPHONE DETAILS. ONCE WE RECEIVE AND PROCEES AN ORDER ARTWORK PROOFS AND PRO FORMA WILL BE EMAILED. CUSTOMER “VISITS” TO TESTA-ROSSA ARE NOT CONVENIENT, COMPANY POLICY IS MAIL ORDER ONLY. ARTWORK SHOULD ALWAYS BE SUPPLIED IN PDF FORMAT OVER CORRECT TESTA-ROSSA TEMPLATES. TEMPLATES SHOULD BE BACKGROUND LAYER AND NOT VISIBLE THROUGH THE ARTWORK. 3MM BLEED MUST BE PROVIDED FOR ALL PAPER PARTS PRINT. RESOLUTION SHOULD BE AT LEAST 300 PIXELS PER INCH. FOR DISC DESIGNS NO BLEED IS REQUIRED, DO NOT CROP CENTRE CIRCLE OF DISC. ALL ARTWORK SPECIFICATIONS AND TEMPLATES CAN BE FOUND ON WEBSITE. ARTWORK CAN BE PROVIDED ON CD OR UPLOADED TO TESTA-ROSSA YOU SEND IT DROPBOX. IF REQUIRED PLEASE EMAIL: info@testa-rossa.com TO OBTAIN YOU SEND IT DROPBOX LINK DETAILS. HOW SHOULD MASTERS BE SUPPLIED? WE NEED A PHYSICAL MASTER POSTING TO PO BOX ADDRESS ON WEBSITE. FOR CD WE NEED A CD MASTER, FOR DVD WE NEED A DVD MASTER, DO NOT USE RE-WRITABLE DISCS. DDP MASTERS FOR CD AUDIO REPLICATION CAN BE UPLOADED TO TESTA-ROSSA YOU SEND IT DROPBOX. DDP MASTERS MUST CONTAIN A CHECKSUM AND MEET APROVAL BY OUR MASTERING DEPARTMENT. DUPLICATION IS WHEN THE AUDIO, VIDEO OR DATA IS BURNT TO A BLANK CD-R OR DVD-R.
REPLICATION IS WHEN THE AUDIO, VIDEO OR DATA IS PRE-EMBEDDED OR “PRESSED” TO THE DISC DURING THE MANUFACTURE OF THE DISC IN PRESSING PLANT. WE QUOTE AS “PRODUCTION TIMES” PRODUCTION STARTS FROM APPROVAL AND PAYMENT. CD AND DVD DUPLICATION WITH NO PRINTED PAPER PARTS: 2-3 WORKING DAYS. 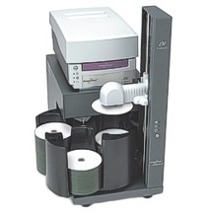 CD AND DVD DUPLICATION WITH PRINTED PARTS: 3-8 WORKING DAYS. CD AND DVD REPLICATION BULK SUPPLY: 7-8 WORKING DAYS. CD AND DVD REPLICATION IN PLASTIC WALLETS NO PRINT: 8 WORKING DAYS. CD AND DVD REPLICATION WITH PRINTED PARTS: 10-11 WORKING DAYS. NO 100% GUARANTEE OF PRODUCTION TIMES CAN BE GIVEN. A PRO FORMA MUST BE RAISED AND EMAILED TO CUSTOMER PRIOR TO PAYMENT. ALL ORDERS MUST BE PAID FOR IN FULL BEFORE WE CAN PROCEED TO PRODUCTION. CARD PAYMENT CAN BE MADE BY TELEPHONE ONCE PRO FORMA IS ISSUED. BACS PAYMENT WITH EMAIL CONFIRMATION ONCE PRO FORMA IS ISSUED. TESTA-ROSSA CAN ASSIGN A UNIQUE EAN-13 BARCODE NUMBER TO AN ORDER, FREE OF CHARGE. £15 CHARGE APPLIES FOR BARCODE GENERATION AND ADDITION TO ARTWORK TO CORRECT GS-1 SPECIFICATION. CUSTOMERS TO LEAVE A WHITE RECTANGULAR BOX ON ARTWORK 3.5CM BY 1.5CM. EAN-13 NUMBERS CAN BE RESERVED PRIOR TO ORDER, £50 DEPOSIT TOWARDS ORDER IS REQUIRED. CAN YOU SUPPLY CELLOPHANE OVERWRAP? CELLOPHANE OVERWRAP IS AVAILABLE ON REPLICATION ORDERS OF 500+ UNITS. JEWEL CASES AND DVD CASES: 2P PER UNIT, CARD WALLETS AND DIGIPACKS: 4P PER UNIT. OVERWRAP IS ENTIRELY OPTIONAL AND CAN BE APPLIED TO WHOLE ORDER OR PART OF ORDER. ALL ORDERS OF ABOVE £500 ARE DELIVERED FREE TO 1 UK MAINLAND ADDRESS, 2 DAY SERVICE. BULK SUPPLY DISCS AND DISC IN PLASTIC WALLET: £9.95+VAT NEXT DAY COURIER. DISCS WITH PACKAGING AND PRINT: £12.95+VAT NEXT DAY COURIER. EXTRA CHARGES APPLY FOR NON UK MAINLAND DELIVERIES, SEE WEBSITE. WE DO NOT EXPORT ORDERS OUTSIDE OF THE UK, CUSTOMER COLLECTION IS NOT AVAILABLE.